Urinary concentrating ability is central to mammalian water balance and depends on a medullary osmotic gradient generated by a countercurrent multiplication mechanism. Medullary hyperosmolarity is protected from washout by countercurrent exchange and efficient removal of interstitial fluid resorbed from the loop of Henle and collecting ducts. In most tissues, lymphatic vessels drain excess interstitial fluid back to the venous circulation. However, the renal medulla is devoid of classic lymphatics. Studies have suggested that the fenestrated ascending vasa recta (AVRs) drain the interstitial fluid in this location, but this function has not been conclusively shown. We report that late gestational deletion of the angiopoietin receptor endothelial tyrosine kinase 2 (Tie2) or both angiopoietin-1 and angiopoietin-2 prevents AVR formation in mice. The absence of AVR associated with rapid accumulation of fluid and cysts in the medullary interstitium, loss of medullary vascular bundles, and decreased urine concentrating ability. In transgenic reporter mice with normal angiopoietin-Tie2 signaling, medullary AVR exhibited an unusual hybrid endothelial phenotype, expressing lymphatic markers (prospero homeobox protein 1 and vascular endothelial growth factor receptor 3) as well as blood endothelial markers (CD34, endomucin, platelet endothelial cell adhesion molecule 1, and plasmalemmal vesicle–associated protein). Taken together, our data redefine the AVRs as Tie2 signaling–dependent specialized hybrid vessels and provide genetic evidence of the critical role of AVR in the countercurrent exchange mechanism and the structural integrity of the renal medulla. Renal blood flow accounts for approximately 20% of total cardiac output in humans, but the kidneys constitute <1% of body mass. Not surprisingly, the renal vasculature is one of the most complex among highly vascularized organs, and it supports the many activities of the kidneys that include plasma filtration, maintenance of fluid, electrolyte and acid-base balance, and endocrine functions.1,2 The various vascular beds of the kidney differ in expression of endothelial markers, presence or absence of fenestrations, variable mural cell coverage, and architectural organization.3 In particular, the renal medullary vasculature consists of fenestrated ascending vasa recta (AVR) and capillary plexus along with the nonfenestrated descending vasa recta (DVR).4 This vasculature plays a major role in maintaining hyperosmolarity of the medullary interstitium to facilitate fluid resorption and promote fluid recycling and homeostasis. The proximity of the AVR and DVR is believed to be central to the countercurrent exchange mechanism, because it enables transport of solute and water while preventing washout of the osmotic gradient in the inner medullary interstitium, which is needed for maximal urine concentration ability.2,5,6 To date, studies with different transgenic mouse lines with knockout of various transporters and channels have confirmed the importance of the nephrons and DVR for urinary concentrating capacity.7 However, no such results have been reported for the AVR. 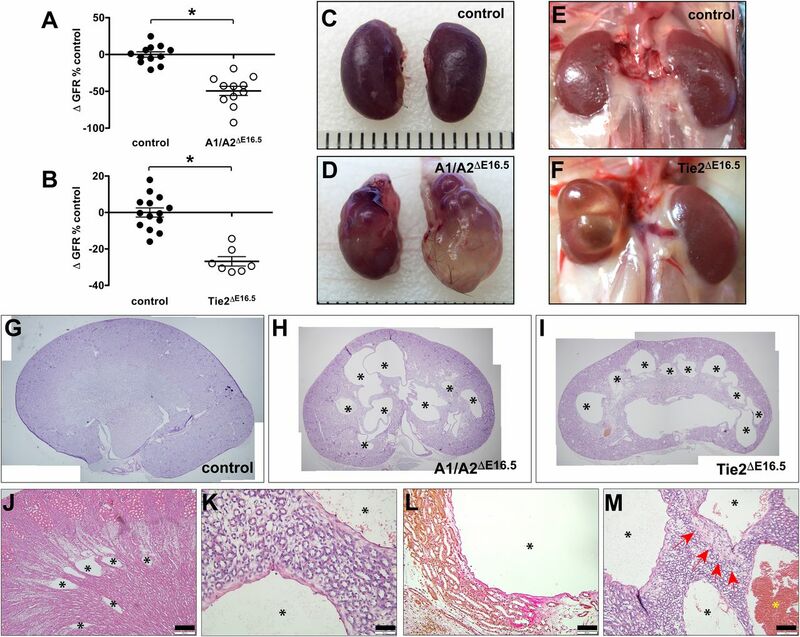 Using a variety of newly generated transgenic mouse lines, we show that loss of both Angpt1 and Angpt2 or the receptor Tie2 at embryonic day E16.5 leads to a cystic renal phenotype and urinary concentrating defect, the result of a dramatic loss of AVR. Furthermore, we show that most, if not all, AVRs have a unique molecular phenotype characterized by lymphatic and blood venous molecular markers. 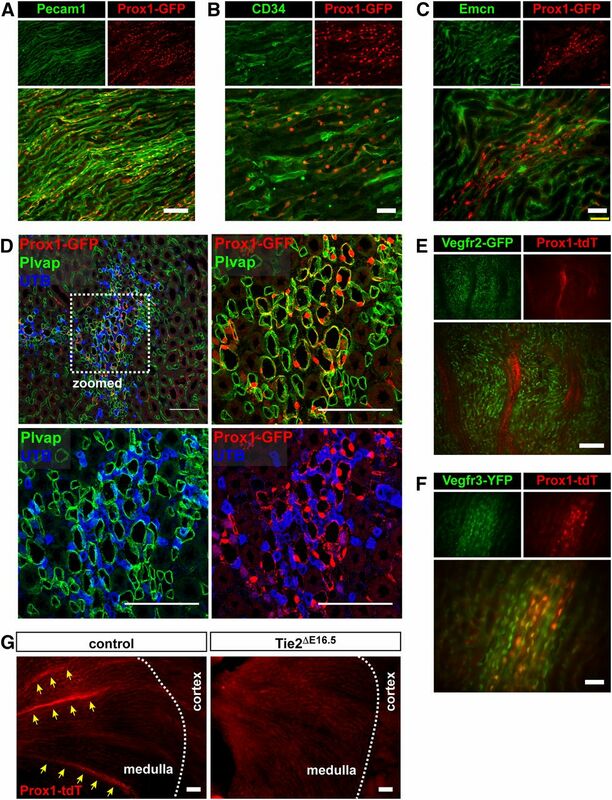 These findings show that the AVR represent hybrid vessels with lymphatic-like features that are needed to perform the crucial role of interstitial fluid drainage in the medulla, a region devoid of classic lymphatic vasculature. To better understand the importance of angiopoietin-Tie2 signaling in the kidney, we first assessed the renal pattern of Tie2 promoter activity. Without a suitable Tie2 antibody for tissue immunolabeling, we genetically labeled cells derived from the Tie2-expressing lineage by intercrossing Tie2-Cre and reporter transgenic mice (Rosa26mTmG and Rosa26lacZ, which results in enhanced green fluorescent protein (EGFP) and β-galactosidase expression in the presence of Cre activity). At P1, Tie2-CreTg/+:R26mTmG/+ hemizygotes show EGFP expression pattern consistent with the distribution of glomerular and peritubular capillaries (Figure 1, A–C). EGFP colocalizes with most, if not all, Emcn-expressing vessels in both the cortex and the medulla (Supplemental Figure 1). 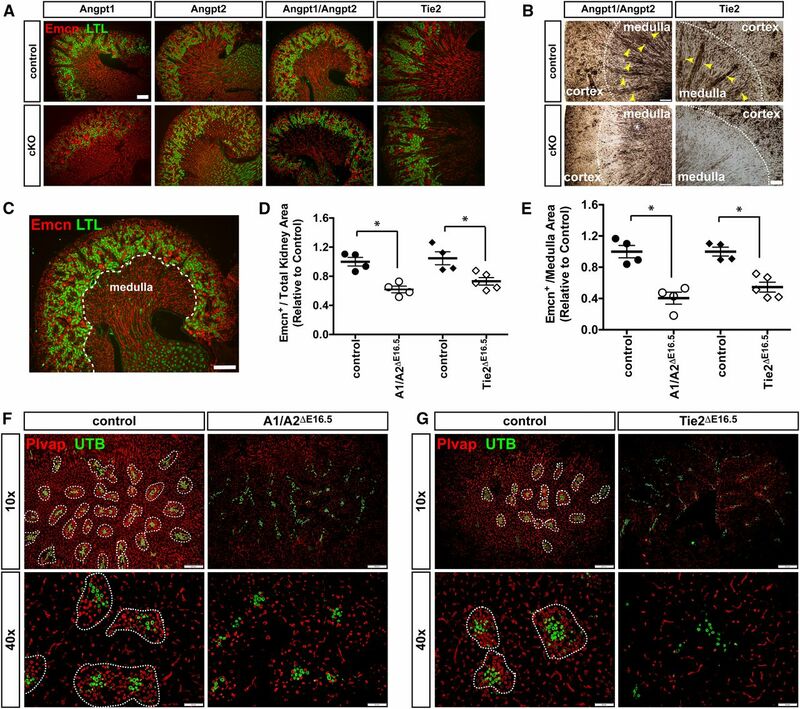 In adult Tie2-CreTg/+:R26lacZ/+ mice, β-galactosidase enzymatic activity reveals a pattern of Tie2-expressing cell derivatives that closely recapitulates the microvascular organization of the kidney, including prominent staining in glomeruli and medullary vascular bundles (Figure 1D). These findings confirm that Tie2-expressing cells give rise to these specialized renal vascular beds. Lineage-tracing analysis reveals Tie2 expression pattern in the renal microvasculature. (A) Cells with prior or current Tie2 promoter activity observed as EGFP fluorescence in a P1 animal doubly hemizygous for the transgenes Tie2-Cre and Rosa26mTmG (R26mTmG). (B) Higher magnification pattern of Tie2 promoter activity in a P1 kidney showing EGFP expression in glomeruli (white arrowheads) and peritubular capillaries within the cortex and medulla. (C) LacZ histochemical staining of a vibratome-sectioned adult kidney from a mouse hemizygous for both Tie2-Cre and Rosa26lacZ (R26lacZ) transgenes showing Tie2 promoter activity consistent with the renal vascular network. (D) Cortical and outer medullary lacZ staining pattern in an adult kidney showing prior or current Tie2-Cre activity in glomeruli, cortical peritubular capillaries, medullary capillary plexus, and medullary vascular bundles (black arrowheads). Scale bars, 100 μm. 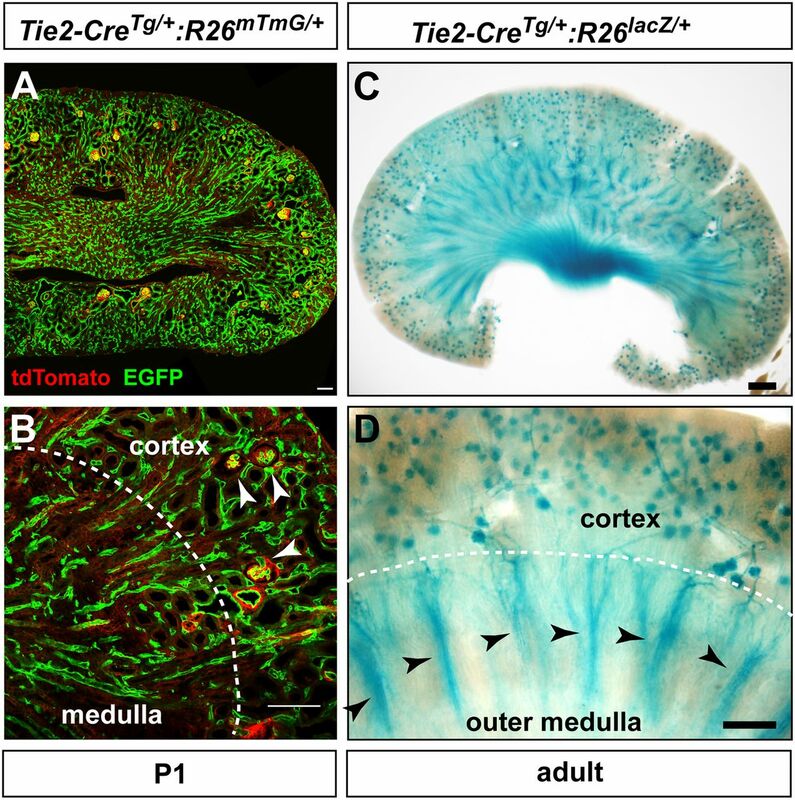 Using a Tet-inducible Cre recombination strategy, we inactivated Angpt1, Angpt2, and Tie2 at late gestation (E16.5) in mice. This overcomes the early lethality of constitutive loss of these genes and allows us to study their relevance in kidney development and function. Homozygous conditional knockout mutants are born within expected Mendelian ratios and live up until adulthood. They are referred to from hereon as follows: Angpt1 knockout (A1ΔE16.5), Angpt2 knockout (A2ΔE16.5), Angpt1/Angpt2 double knockout (A1/A2ΔE16.5), and Tek/Tie2 knockout (Tie2ΔE16.5). Other genotypes were classified as controls and did not manifest overt renal phenotypes. A1/A2ΔE16.5 mutant mice have 92% reduction in Angpt1 and 84.5% reduction in Angpt2 mRNA transcript levels in the kidneys compared with control littermates as determined by quantitative RT-PCR analysis (Supplemental Figure 2, A and B). Tie2 protein levels in the kidneys were diminished 66.8% in Tie2ΔE16.5 mutant mice compared with kidneys from their control cohorts (Supplemental Figure 2, C and D). Adult (8–10 weeks old) A1/A2ΔE16.5 and Tie2ΔE16.5 mutant mice compared with control littermates have 49.5% and 26.9% reduction, respectively, in GFR, an index of diminished renal function (Figure 2, A and B). However, neither A1/A2ΔE16.5 nor Tie2ΔE16.5 mutants show overt proteinuria and have insignificant urinary albumin-to-creatinine ratios relative to controls, despite having markedly reduced GFR (Supplemental Figure 3, A and B). Consistently, A1/A2ΔE16.5 and Tie2ΔE16.5 mutants have normal glomerular histology and ultrastructure (Supplemental Figure 3, C and D). Renal cysts develop in the absence of Angpt1/2-Tie2 signaling. (A) Reduced GFR in A1/A2ΔE16.5 mutants. (B) Reduced GFR in Tie2ΔE16.5 mutants. Asterisks in A and B denote statistical significance at P<0.05. Gross kidney appearances in adult mice showing renal cysts in (D and F) compound Angpt1/2 (A1/A2ΔE16.5) and Tie2 (Tie2ΔE16.5) knockout mutants in comparison with (C and E) their control littermates, respectively. (G–I) Stitched images of hematoxylin and eosin histology of adult kidneys showing multiple cysts (asterisks) in A1/A2ΔE16.5 and Tie2ΔE16.5 mutants. (J) Medullary microcyst (asterisks) development in a P10 Tie2ΔE16.5 kidney. (K) Higher magnification image showing squamous cells lining renal cysts. (L) Van Gieson staining reveals collagen matrix accumulation around cysts (shown from a representative A1/A2ΔE16.5 kidney). (M) Occasional hemorrhage in renal cysts (yellow asterisk) shown from a representative of hematoxylin and eosin–stained A1/A2ΔE16.5 kidney. Specimen ages: 10 weeks in A, B, and E–I; 20 weeks in C, D, and K–M; and P10 in J. Scale bars, 100 μm in J–M. Unexpectedly, kidneys dissected from adult A1/A2ΔE16.5 and Tie2ΔE16.5 mutant animals were grossly cystic (Figure 2, C–F). Histologic analysis reveals the presence of multiple macrocysts in 8- to 10-week-old A1/A2ΔE16.5 and Tie2ΔE16.5 mutants (Figure 2, G–I). As early as postnatal age P2, microcysts start to emerge with variable penetrance within the renal outer medulla, although these medullary microcysts become clearly prominent at age P10 in kidneys from A1/A2ΔE16.5 and Tie2ΔE16.5 mutants (Figure 2J). However, in adult mutant mice, huge cysts have distorted the renal parenchyma, making the exact location of the cystic lesions obscure. The cysts are typically lined with flattened cells, which in adult mutants, show increased matrix deposition (Figure 2, K and L). Cellular infiltration, likely from inflammatory macrophages, and erythrocyte-filled cysts are occasionally seen in severely cystic mutant kidneys (Figure 2M). In contrast, singular A1ΔE16.5 or A2ΔE16.5 mutants do not develop renal cysts, indicating that a compound loss of Angpt1 and Angpt2 is necessary to mitigate cyst formation. We performed multiple marker analyses through antibody and lectin staining of kidney sections to characterize the renal cysts found in A1/A2ΔE16.5 and Tie2ΔE16.5 mutants (Figure 3A). The cysts lack expression of multiple epithelial tubule markers: Na+/K+-ATPase, Lotus tetraglobulus lectin for proximal tubules, uromodulin for the thick ascending limb of the loop of Henle, Ksp-cadherin for distal tubules, and aquaporin-2 and pancytokeratin for collecting ducts. The cysts also do not express the common blood endothelial cell markers Emcn, Cd34, and Pecam1. Podxl, normally expressed by peritubular capillaries and large caliber renal blood vessels, and Plvap/PV1, which is expressed in diaphragm-containing capillaries, were also negative in the renal cysts. The lymphatic endothelial marker Lyve1 is also absent in the cysts. In contrast, several myofibroblast markers strongly and uniformly stain the cysts, including α-smooth muscle actin (Acta2), calponin-1 (Cnn1), SM22α/transgelin (Tagln), vimentin (Vim), desmin, and PDGFRβ receptor. Microcysts in younger (P2–P5) A1/A2ΔE16.5 and Tie2ΔE16.5 mutant animals also show prominent expression of the same myofibroblast markers but do not show prominent expression of epithelial or endothelial markers. Renal cysts arising from loss of Angpt1/2-Tie signaling uniformly express myofibroblast markers. (A) Representative immunofluorescence analysis of renal cysts (yellow asterisks) found adult A1/A2ΔE16.5mutants showing lack of expression of epithelial tubule–specific (L. tetraglobulus lectin [LTL], Na+/K+-ATPase [Atp1b1], uromodulin [Umod], Ksp-cadherin [Cdh16], aquaporin-2 [Aqp2], and pancytokeratin [PCK]) and endothelial (Emcn, Cd34, Pecam1, Plvap, Podxl, and Lyve1) markers but strong expression of myofibroblast markers (Acta2, Cnn1, Tagln, Vim, desmin [Des], and PDGFRβ receptor [Pdgfrb]). (B and C) Scanning electron and (D) transmission electron micrographs of renal cysts (yellow asterisks) in an adult Tie2ΔE16.5 kidney showing the squamous mesenchymal morphology of cells lining cysts (nuclei labeled m). Fibrillar deposits are also visible underneath the cyst linings (arrows). Scale bars, 100 μm in A; 500μm in B; 200 μm in C; 10 μm in D.
Ultrastructural imaging of the renal cysts in Tie2ΔE16.5 mutant animals reveals that the cysts are lined by nonciliated squamous cells (Figure 3, B–D). These flattened cells are relatively smooth and lack luminal villous brush border–like projections. The presence of fibrillar matrix directly underneath these spindle-shaped cyst wall cells is evident in transmission electron micrographs of Tie2ΔE16.5 mutant kidneys (Figure 3D). Serial sectioning of postnatal P5 kidneys followed by staining for Emcn and L. tetraglobulus lectin (to demarcate the cortex from the medulla) reveals that Emcn+ve vessels are notably sparse in A1/A2ΔE16.5 and Tie2ΔE16.5 but are not notably sparse in singular mutants A1ΔE16.5 or A2ΔE16.5, particularly within the outer medulla (Figure 4A). A striking paucity of Emcn+ve outer medullary vascular bundles is observed in P14 kidneys from both A1/A2ΔE16.5 and Tie2ΔE16.5 kidneys (Figure 4B). Quantification of Emcn-stained areas relative to total tissue area indicates that overall vascular density is reduced by 38.3% and 26.9% in A1/A2ΔE16.5 and Tie2ΔE16.5 relative to control littermates, respectively (Figure 4, C and D). More pronounced microvascular rarefaction is observed within the medulla, where Emcn+ve-stained areas are reduced by 59.6% and 45.4% in A1/A2ΔE16.5 and Tie2ΔE16.5 mutants, respectively, compared with controls (Figure 4, C and E). AVRs are lost and renal vascular density is reduced upon attenuation of Angpt1/2-Tie2 signaling. (A) Sagittal sections of P5 kidneys doubly stained for Emcn and L. tetraglobulus lectin (LTL) showing attenuated vascular density in the absence of both Angpt1 and Angpt2 together and Tie2 but not in singular loss of Angpt1 or Angpt2. (B) Immunohistochemical staining for Emcn in adult kidneys showing persistence of renal vascular density reduction in A1/A2ΔE16.5 and Tie2ΔE16.5 mutants and notable loss of medullary vascular bundles (yellow arrowheads). cKO, homozygous conditional knockout mutant. (C) Representative sagittal section of a P5 kidney indicating the demarcation (white dotted line) of cortical and medullary regions on the basis of LTL-stained proximal tubules for quantification of Emcn staining density. (D) Emcn staining area normalized to total tissue area in fully sectioned kidneys showing reduced total renal vascular densities in A1/A2ΔE16.5 and TieΔE16.5 mutant compared with control littermates. (E) Emcn staining density indicating significant medullary vascular reduction in A1/A2ΔE16.5 and TieΔE16.5 mutants relative to controls. (F) Plvap and UTB coimmunostaining of transverse kidney sections at the level of the outer medulla showing diminished Plvap-stained microvasculature in a representative kidney from an A1/A2ΔE16.5 mutant. AVR clusters but not the DVRs are lost in A1/A2ΔE16.5 mutants. (G) Diminished Plvap-stained microvasculature in the outer medulla in representative kidney from a TieΔE16.5 mutant. Similar to A1/A2ΔE16.5 mutants, TieΔE16.5 mutants have distinctive loss of AVRs but not the DVRs. (F and G) Vascular bundles formed by Plvap+ve AVR and UTB+ve DVR are encircled. Scale bars: 200 μm in A–C, F, upper panel, and G, upper panel; 50 μm in F, lower panel, and G, lower panel. Statistically significant means (P<0.05) are denoted by asterisks in D and E.
We then stained kidney sections with Plvap, an integral protein of fenestral diaphragms found in AVR and interbundle capillary plexus.25 Consistently, as seen after Emcn staining, Plvap+ve vessels are scant in the outer medulla of kidneys from both A1/A2ΔE16.5 and Tie2ΔE16.5 in P14 pups (Figure 4, F and G). Plvap staining reveals that vessel rarefaction occurs within the medullary vascular bundles and interbundle capillary plexus of mutant kidneys. In contrast, the abundance of UTB+ve DVR clusters is comparable between mutants and control kidneys (Figure 4, F and G). Thus, the disappearance of vascular bundles is due to specific loss of the AVR. Angpt1/2-Tie2 signaling is, therefore, essential for the establishment of the AVR and the interbundle capillary plexus. The AVR, DVR, and medullary capillary plexus play important roles in fluid recycling and concentration of urine. The pronounced simplification of the medullary capillary bed due to inactivation of Angpt1/2-Tie2 signaling, therefore, led us to suspect that fluid resorption through medullary vessels could be compromised. Indeed, A1/A2ΔE16.5 and Tie2ΔE16.5 mutant mice kept in metabolic cages have increased urinary outputs (2.7- and 3.9-fold higher compared with controls, respectively) within a 24-hour period (Figure 5, A and B). Additionally, urine obtained from A1/A2ΔE16.5 and Tie2ΔE16.5 mutant mice is significantly more dilute relative to that of controls on the basis of osmolality measurements (approximately 52% and 66% of controls, respectively) (Figure 5, C and D). These findings, therefore, strongly implicate Angpt1/2-Tie2 signaling in indirect regulation of urine concentration and fluid homeostasis. A1/A2ΔE16.5 and Tie2ΔE16.5 mutants have urine concentration defects. Total urine collected within a 24-hour period showing increased urine output from (A) A1/A2ΔE16.5 and (B) Tie2ΔE16.5 mutants. Osmolality measurements on urine samples showing dilute urine production from (C) A1/A2ΔE16.5 and (D) Tie2ΔE16.5 mutants. Statistically significant means (P<0.05) are denoted by asterisks. 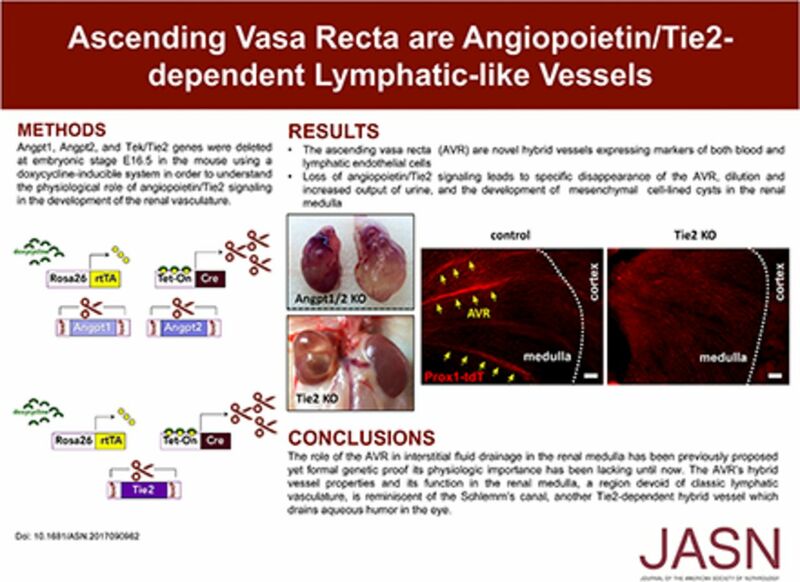 On the basis of previous studies from our laboratory, where we identified a key role of angiopoietin-Tie2 signaling in the formation of lymphatic-like SC in the eye,24 we wondered if any of the vessels lost in the kidney also exhibited lymphatic or hybrid endothelial characteristics. We incorporated Prox1 fluorescent (EGFP or tdTomato) transgenes into our Tie2 conditional genetic crosses to assess potential restructuring of Prox1+ve lymphatic or hybrid vessels. Similar to lymphatic vessels and the SC,26–29 we found that the AVRs were genetically labeled with Prox1. Prox1 reporter activity was found coexpressed with Pecam1, CD34, and Emcn in vascular bundles in the outer medulla of control animals (Figure 6, A–C). More importantly, these bundled vessels expressing both PV1 and Prox1 promoter activity are distinct from nearby Prox−ve/PV1−ve/UTB+ve DVR (Figure 6D). These Prox+ve vessels, therefore, are identical to the AVRs. Unlike the capillary plexus, VEGFR2 expression is absent in these Prox1+ve AVR vessels (Figure 6E). Instead, expression of promoter activities for Prox1 and VEGFR3 (markers strongly expressed in lymphatic vessels28) colocalizes in the AVR (Figure 6F). However, the AVRs lack expression of other canonical lymphatic markers, such Lyve1 and podoplanin (Pdpn)30,31 (Supplemental Figure 4). Interestingly, these Prox+ve medullary vascular bundles are dramatically lost in kidneys from Tie2ΔE16.5 mutants (Figure 6G). In contrast, Lyve1+ve/Pdpn+ve arcuate lymphatic vessels remain present in kidneys from A1/A2ΔE16.5 and Tie2ΔE16.5 mutants. Altogether, these findings indicate that the AVRs are Tie2-dependent hybrid vessels with intermediate properties of blood and lymphatic endothelial cells. The AVR bundles lost on inactivation of Angpt1/2 signaling express Prox1 and Vegfr3. In Prox1-GFP reporter mice, vessels within medullary vascular bundles coexpress GFP with (A) Pecam1, (B) CD34, (C) Emcn, and (D) Plvap but not UTB. (E) TdTomato and GFP expressions in Prox1-tdTomato (Prox1-tdT)/Vegfr2-GFP double-reporter mice do not overlap. Prox1-tdT+ve medullary vessels do not express GFP. (F) In Prox1-tdT/Vegfr3-YFP double-reporter mice, YFP expression overlaps with tdTomato in medullary vascular bundles. (G) Prox1+ve AVR vessels are lost in kidneys from Tie2ΔE16.5 mutants. Scale bars: 100μm in A, D, F, and G; 50 μm in B, C, and E.
Histologic examination of late embryonic kidneys (E18.5) and postnatal P2 kidneys reveals a notable expansion of the medullary interstitium concomitant with the thinning of vascular arrays in A1/A2ΔE16.5 and Tie2ΔE16.5 mutants (Figure 7, A and B). We, therefore, inferred that loss of vascular bundles could have resulted in altered patterning of perivascular support cells and the surrounding interstitium. We first analyzed the renal expression of the mesenchymal marker Cnn1 during late gestation (E18.5) and perinatally (P1, P2, and P5). We found that Cnn1 has markedly broader expression in all four time points examined in both A1/A2ΔE16.5 and Tie2ΔE16.5 mutants consistent with the histologic findings (Figure 7, C and D). Similar elevated and widened expression patterns are seen with other myofibroblast markers that we found expressed in renal cysts, such as Acta2, Pdfgfrb, Tagln, and Vim (Figure 7E). In kidneys of P1 pups, transcripts for Pdgfb were elevated 85% relative to controls (Figure 7F). Thus, loss of Angpt1/2-Tie2 signaling upregulates the expression of PDGFB, a growth factor that likely promotes the hyperproliferation of PDGFRβ-expressing medullary interstitial or perivascular cells. Intriguingly, the same myofibroblast markers are also the ones that we found expressed by the squamous cells lining the cysts of kidneys from A1/A2ΔE16.5 and Tie2ΔE16.5 mutants. In adult control animals, the expressions of the myofibroblast markers Acta2, Cnn1, and Tagln are restricted to smooth muscles covering large caliber blood vessels, whereas Vim expression in addition is also found strongly expressed in podocytes (Supplemental Figure 5). 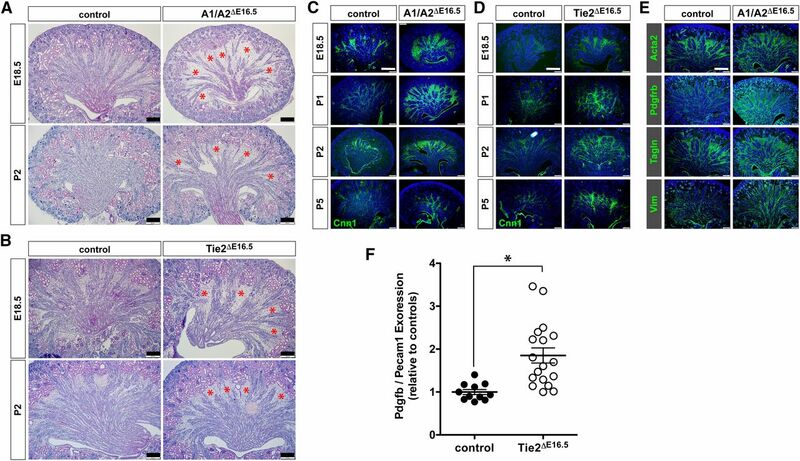 A1/A2ΔE16.5 and Tie2ΔE16.5 mutants have abnormal expansion of the renal interstitium. (A and B) Periodic acid–Schiff histology of E18.5 and P2 kidney sections showing similar expansion of medullary interstitium (red asterisks) in A1/A2ΔE16.5 and Tie2ΔE16.5 mutants. (C and D) Immunofluorescence staining for the interstitial marker Cnn1 showing expansion of the interstitium at E18.5, P1, P2, and P5 in A1/A2ΔE16.5 and Tie2ΔE16.5 mutants. (E) Immunofluorescence staining for other myofibroblast markers (Acta2, PDGFRβ receptor [Pdgfrb], Tagln, and Vim) notably expressed in the medullary interstitium as seen in P1 kidneys showing increased expression of these markers in the kidneys of A1/A2ΔE16.5 mutants. (F) Renal expression of Pdgfb is increased in the absence of Tie2 signaling on the basis of quantitative RT-PCR analysis. Pdgfb relative to Pecam1 gene expression as normalized to controls from P1 kidneys. Statistically significant means (P<0.05) are denoted by an asterisk. Scale bars: 200 μm in A and B; 400 μm in C–E. Excess interstitial fluid is generally removed by the lymphatic system and recirculated back into the systemic blood vasculature. In the kidney, definitive lymphatic vessels surround hilar renal arteries and cortical interlobular and arcuate arteries, and they are found within the renal capsule.32,33 Paradoxically, conventional lymphatic vessels are absent in the renal medulla,32–34 although it has a great need for clearance of interstitial fluid. Instead of these vessels, the renal medulla is thought to rely on fenestrated AVRs and their connection to the arcuate veins for efficient removal of medullary interstitial fluid and preservation of the crucial medullary osmotic gradient.3,6,35–37 The specialized features of the AVR, such as abundant fenestrations, lack of mural cell coverage, and strategic organization into vascular bundles in the outer medulla, are believed to contribute to their high hydraulic conductance.4,38–41 However, the molecular basis of development and differentiation of the AVR have not been reported previously. Furthermore, formal genetic proof has not been provided to show their role in renal medullary fluid removal. This study shows that angiopoietin-Tie2 signaling is vital for the normal development of medullary microcirculation and in particular, the AVR. 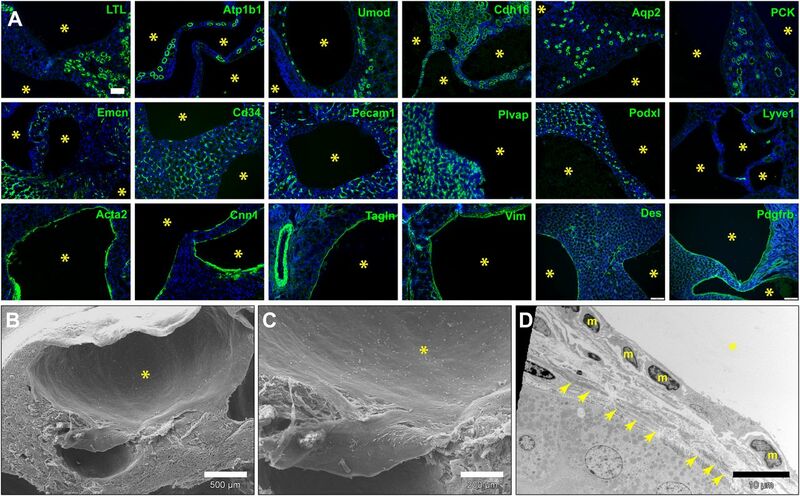 When genetically attenuated, angiopoietin-Tie2 signaling results in the absence of vascular bundles of the outer medulla and the rarefaction of surrounding capillary plexus. Although lineage tracing studies revealed that Tie2-expressing cells give rise to the majority, if not all, of the vessels within the medullary vascular bundles, the AVRs but not the DVRs seem to be absent when Tie2 signaling is lost at E16.5. This finding suggests a time-sensitive requirement for Angpt-Tie2 signaling in AVR formation. The hybrid phenotypic and molecular characteristics of the AVR closely resemble those found in SC, a vessel that drains back into the venous system the aqueous humor produced in the anterior chamber of the eye. Recently, the SC has been described as a hybrid vessel expressing Prox1, VEGFR3, CD34, Emcn, and Plvap but not Lyve1 or Pdpn.29,49 Intriguingly, the development of the AVR and the SC depends on cooperative agonist functions of Angpt1 and Angpt2 on Tie2 activation.11,14,21,24 In contrast, with blood vascular development, Angpt1-dependent Tie2 activation is antagonized by Angpt2.11,14,21,24 The context-dependent requirement for Angpt1 and Angpt2 in AVR development, therefore, is consistent with its hybrid phenotype. As predicted, mice that lack AVRs exhibited reduced urinary concentrating capacity. Unexpectedly, however, the mice also developed a dramatic cystic phenotype. Analysis of multiple markers indicated that the cysts are not derived from vascular or epithelial cells. Instead, the cysts are lined by squamous mesenchymal PDGFRβ+ve cells that uniformly express multiple myofibroblast markers (Cnn1, Tagln, Acta2, and Vim). Interestingly, inactivation of angiopoietin-Tie2 signaling results in expansion of PDGFRβ+ve and myofibroblast-like mesenchyme in the renal medulla. One plausible explanation for the increase in PDGFRβ+ve medullary mesenchyme is the upregulation of the Pdgfb gene encoding the PDGFRβ ligand PDGFB, which we observed in Tie2ΔE16.5 mutant animals. Excessive PDGFB levels in conjunction with increased interstitial fluid flow could also facilitate the differentiation of the interstitial mesenchyme into myofibroblasts.50,51 In venous malformations linked to hyperactivation of Tie2, perivascular support is diminished, whereas endothelial expression of Pdgfb is suppressed, a finding that indicates that Tie2 negatively regulates the expression of Pdgfb.52 The cysts progressively enlarge with age, suggesting fluid accumulation. We posit that these cysts represent collections of interstitial fluid entrapped by myofibroblast-like cell derivatives of the medullary interstitium or perivascular cells. The broadening of the medullary interstitium with concomitant impaired circulatory drainage could contribute to altered fluid dynamics in the medulla and subsequent fluid retention. The renal cysts are also reminiscent of the dramatic buphthalmos (bulging of the eyes) that results from development failure of the SC and impaired aqueous humor drainage due to loss-of-function mutations in angiopoietin-Tie2 signaling,24,53 providing additional parallels between function of AVR and SC. Conditional floxed alleles of murine genes for Angpt1, Angpt2, and Tek/Tie2 were described previously.24 These genes were bred accordingly with the transgenes R26-rtTAand tetO-Cre, allowing for doxycycline-induced whole-body inactivation of the floxed alleles. Doxycyline (0.5% [wt/vol]) was administered in drinking water of time-mated dams from the 16th day of gestation (E16.5) until pups were weaned (P21). Renal Tie2 expression was mapped by breeding Tie2-Cre with R26-LacZ or R26-mTmG reporter mice. Transgenic Prox1-EGFP and Prox1-tdTomato, Vegfr3-YFP, and Vegfr2-GFP reporter mice were used to identify Prox1+ve, Vegfr3+ve, and Vegfr2+ve vessels. Mouse genotyping was done by PCR. Mouse rearing, husbandry, and phenotyping were carried out following ethical procedures approved by the Institutional Animal Care and Use Committee of Northwestern University. Additional methods are included in Supplemental Material. We are grateful to the staff of the Center for Comparative Medicine of Northwestern University for assistance in animal care. We are indebted to Douglas Holmyard (Mount Sinai Hospital, Toronto, Canada) for help with electron microscopy. We are thankful to Dr. Peter S. Aronson (Yale University) for his gift of Ksp-cadherin antibody. We would like to acknowledge Douglas Fambrough (Johns Hopkins University) and Eugene Butcher (Stanford University) for antisera against Na+/K+-ATPase and Plvap, respectively, which were obtained through the Developmental Studies Hybridoma Bank (University of Iowa). We express our gratitude to Thomas Pannebecker (University of Arizona) for helpful suggestions on immunostainings of the vasa recta. Imaging work was performed at the Northwestern University Center for Advanced Microscopy, and it was generously supported by National Cancer Institute Cancer Center support grant P30 CA060553 (to the Robert H. Lurie Comprehensive Cancer Center). This work was funded with research grants from the National Institutes of Health: grants 1R01GM120592-01 (R.V.S. ), R01-DK41707 (to J.D.K. and J.M.S. ), 1R01HL124120-01 (to S.E.Q. ), R01EY025799 (to S.E.Q. ), and 5T32DK108738-02 (to S.E.Q.). See related editorial, “Unique Gene Expression in Developing Ascending Vasa Recta: A Tale of Tie,” on pages 1073–1074. This article contains supplemental material online at http://jasn.asnjournals.org/lookup/suppl/doi:10.1681/ASN.2017090962/-/DCSupplemental.